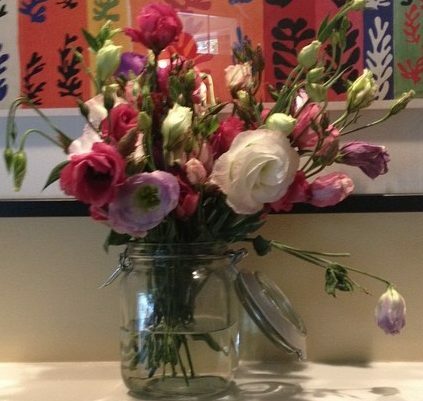 I love fresh flowers in the house, especially in the bathroom! I just get a couple of bunches from the local grocery store or from the farmer’s market (even better- support your local farmers!). Be sure to cut the stems at an angle so they will absorb water better and take off any leaves that are really low (you don’t want leaves below the water level). Replace the water when it starts to look cloudy. If you do this, they should last at least a week. What a great, easy way to decorate the bathroom!